When is it Dementia or Alzheimers disease? It is a fact that almost half the people over age 85 have Alzheimer's disease. It is also a fact that other problems, such as a urinary tract infection, brain tumors, hypothyroidism, and depression can have similar symptoms. It is important that anyone with these symptoms consult with their physician to get diagnosed and treated. While there is currently no cure for Alzheimers, early diagnosis and treatment including medication can delay or minimize many of the problems associated with the disease. 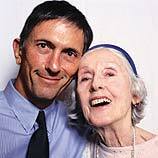 The Alzheimer's Association is a wonderful resource for information and support.They can be reached at 1.800.733.0402 or www.alz.org or www.alzheimers.org. Wandering is a common problem in those with Alzheimer's. Safe Return is a nationwide identification, support and registration program available 24 hours every day through the Alzheimer's Association. If a registrant is missing, Safe Return can fax the person's information and photo to local law enforcement. A person with Alzheimer's will eventually forget their likes and dislikes. They will however know when something isn't as they like it but will not be able to explain why. As soon as possible, document the person's routine. Do they like their shower in the morning or at night, what are their eating patterns, do they like to wear pajamas to bed, do they like to listen to music, what hobbies have they been interested in, etc. Join the Journey For example, a son went to visit his mother in an Alzheimer's facility. Each time he would come for a visit she would ask where his father was. The son would say, Mom, he died some time ago. For the mother, this was like the first time she had heard the news and she would cry for three days. Each visit was filled with sadness. The son did not want to lie, but on one visit when his mother asked him where his father was he responded with what used to be and said, He's at work. They had a very pleasant visit and this technique facilitated many other pleasant visits. Simplify tasks and create calm. Over-stimulation from noise, television, and crowding can lead to anxiety/agitation. Help someone with Alzheimer's feel needed by including them in the daily tasks of making the bed, folding laundry or washing the dishes. Put pictures of caregivers on the door or refrigerator. This helps to reduce confusion. Create a bulletin board or photo album of activities youve shared. Its a nice way for someone to experience what theyve forgotten. Keep active and involved. Include the loved one in nature walks and other exercises, contact with pets, working in a garden, crafts, musical entertainment, decorating, baking, games, watching a movie, massage, church, manicure, and outings. Remember that a person with Alzheimer's is doing the best they can. Do not criticize but redirect if an action is not appropriate. Be aware that your tone of voice and behavior are often contagious and may be upsetting if unpleasant. To many the responsibility for taking their medications correctly is a big stress. Set medications up in a mediset (pillbox). If the medications are being moved around in the mediset then it is important to get a mediset where the medications for that day are in a separate box and can be put out separately. Take unneeded medications out of the home. Some families use a lock box for medications. If a person with Alzheimer's keeps asking for their medications because they can't remember they have taken them, it is helpful to have them sign on a calendar when they take them. You then have their signature as a way resolve the stress. Have you ever spoken to someone who seemed confused until they put in their hearing aid? Many people with unaddressed hearing loss will act confused and may even exhibit signs of dementia. The elderly should have their hearing checked periodically. For those who have hearing aids, regular checkups and a routine for changing the batteries needs to be established. It seems simple, but it can make all the difference.